Monkeypox has been diagnosed in the UK for the first time, a public health body warns. The rare viral infection does not spread easily between humans and most people recover within a few weeks. Public Health England (PHE) said the patient was a resident of Nigeria where the virus was probably contracted. 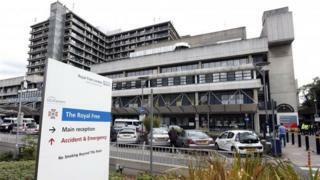 The patient had been staying at a naval base in Cornwall but is now being treated at the infectious diseases unit at the Royal Free Hospital in London. The patient travelled to London from Nigeria on 2 September and anyone who has not been contacted yet from that flight is advised no further action is required. "We are using strict isolation procedures in hospital to protect our staff and patients," he added. Dr Nick Phin, the deputy director of the National Infection Service at PHE, said: "It is important to emphasise that monkeypox does not spread easily between people and the overall risk to the general public is very low. "Public Health England is following up those who have had close contact with the patient to offer advice and to monitor them as necessary." He said PHE and the NHS have "well established and robust infection control procedures for dealing with cases of imported infectious disease and these will be strictly followed to minimise the risk of transmission".